25th January was an important date for P4poetry.....we had our first poetry meet outside Mumbai at Bhopal organized by the Bhopal P4poetry members.And we are extremely proud of them because they organized it so professionally with a compere. Neeraj Guru and Arvind Kharbanda ! You need a big pat at the back .You were awesome !!!! 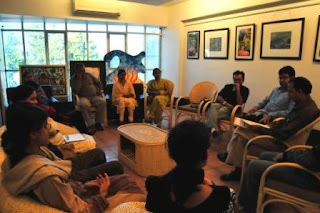 It was organized at Cafe Rendevous which has a special room for Art activities like poetry,theatre,discussions etc and despite 6 poetry meets in the city the same evening( a weeklong kala aayojan had kickstarted the same day ) we got approximately 15 people who attended the show. Raj and I were fortunate enough to attend the poetry meet and we familiarized everybody with the latest exciting happenings at P4poetry. 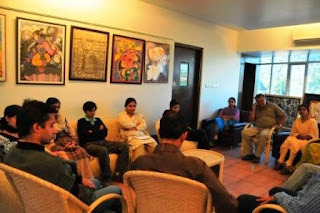 Arvind's ghazal rend itions were easy on the ears( we didnt have to refer to dictionaries ! ) and deep on the meanings; Neeraj Guru's social cause poems made you ponder ; Anita Dwivedi's poems were inspiring on the language and flow evoking beautiful visual imageries; Cheema's poems were sweet and tender and Mr Dwivedi's two liners were witty and spontaneous. The group is so enthused now that they planned to meet up again on Friday over a candlelit dinner and will do atleast a monthly meet. It is almost 10 months since we started p4poetry.com. We have grew from a 4 member team to a huge website of about 1000 members. The reason we grew and became the leading poetry website of country is very obvious: the visitors who read and discuss, poets who write and share, people who advice and help and the god who always watches over us and the noble cause. We were not stagnant and we will never be. We iterated our website and ideas with the experience and feedback. We evolved. And so did our esteemed members. We started with a very basic website. And then came Indian language support and then came podcasting support and then came Forum and then came real time chat and then SMS poetry concept. At p4poetry, things kept on coming, like our loyal visitors. If we compare this data with all website of similar size, we have 15.55% more visits, 109.78% more pageviews and 288.62% more average time on Site. We have very loyal people visiting us. 3699 people visited us for more than 200 times. 2710 people visited us between 101-200 times. 2877 people visited us between 51-100 times. We have 4496 people who spent more than 30 minutes in single session. 7707 people who spent between 10-30 minutes and 13944 people who spent between 1-10 minutes. We got 3495 people who visited more than 20 pages and 5310 people who visited more than 10-20 pages in a single visit. 32.35% of the visitors came to p4poetry via search engines and 29.27 people came here via various other websites linking to us, including email forwards. We received visitors from 136 countries/territories. Top 5 of them were: India (38622 visits), US(4176), UK(788), Canada(531) & UAE(428). I feel proud to tell you that we got visitors not only from a normal computer but also from mobile phones, iphone, ipod, playstations, android etc. And the all data mentioned above does NOT include blog and forum. Let the passion for poetry spread. When we started the website, we wanted to enable SMS poetry option. But, we thought to start with basic features and then gradually improve it. And I suppose, we did it and we did it well. Today is special because it is an attempt to expand our wings beyond the web. I hope this will be as much fun to use for you, as it was to develop for me. Without much introduction, Lets start with two Basic questions. How to register for SMS poetry? Send POET your_nick_name to 56767888. How to post a poem? Send "POEM your_poem" to 56767888. For example: If I want to send a SMS poem, I will write POEM you can publish your poems via sms in few words, Thanks to mighty geek, hail the god of nerds. Note: Please note that POEM word is necessary at the start while sending a poem. This feature is in beta stage. So, if you face a problem please report it to web@p4poetry.com or leave a comment here. Seema Saha for the poem " Enlightenment "
She gets a book of her choice from "Manjul Publishing"
Anuradha for the poem " In Search of Enlightenment"